Canon has released a firmware update for the EOS-1D X Digital SLR Camera. Auto focusing performance under low-light conditions has been enhanced when performing focusing before shooting in AI Servo AF mode. The enhancement comes from the improvement in tracking capability for the first image in the low-light conditions. The number of release parameters settings for the “AI Servo AF 2nd image priority” AF function has been increased to enable improved AF tracking in low light or maintain consistent high frames rates during continuous shooting. The number of parameters for acceleration/deceleration tracking in the AF Configuration Tool will has been increased. Exposure compensation can be performed when using manual exposure and ISO Auto. The minimum shutter speed limit for ISO Auto has been increased with shutter speeds up to 1/8000. A new function to keep the exposure constant by altering the ISO or shutter speed in manual exposure, when the aperture value changes when zooming or changing lenses has been added. A new option to continue to use the previously manually selected AF point as the initial starting AF point when switching to 61-point automatic selection has been added. New customization of the Exposure metering and AF controls has been added for more flexibility. The number of possibilities for controls to switch between one-shot AF and AI Servo AF using custom controls has been increased. A function has been added to allow the playback and review of protected images only. A phenomenon has been fixed in which the white balance may be disturbed by the timing of the shutter release when the drive mode is single shooting and a flash (E-TTL)is used. Firmware Version 2.0.3 is for cameras with firmware Version 1.2.4 or earlier. If the camera's firmware is already Version 2.0.3, it is not necessary to update the firmware. When updating the firmware of your camera, please first review the instructions thoroughly before you download the firmware. Once the EOS-1D X camera is updated to Version 2.0.3, it cannot be restored to a previous firmware version (Version 1.0.2 through 1.2.4). It is recommended that the latest application software be used, once the EOS-1D X is updated to the new Firmware Version 2.0.3 from older firmware (Versions 1.0.2 through 1.2.4). Certain previous versions of these applications do not support functions which are added by the new firmware. You can download the latest application software from our Web site. Accompanying the enhancements to the functions, the instruction manual has also been revised. Users are asked to download both the latest firmware and the instruction manual. You can download the latest instruction manual from our Web site. 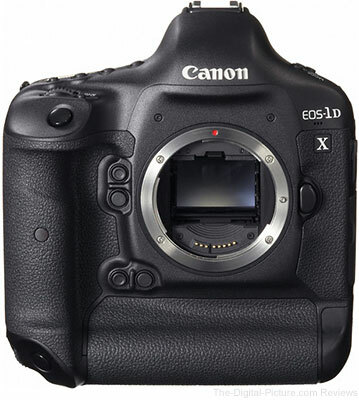 B&H carries the Canon EOS-1D X DSLR Camera.